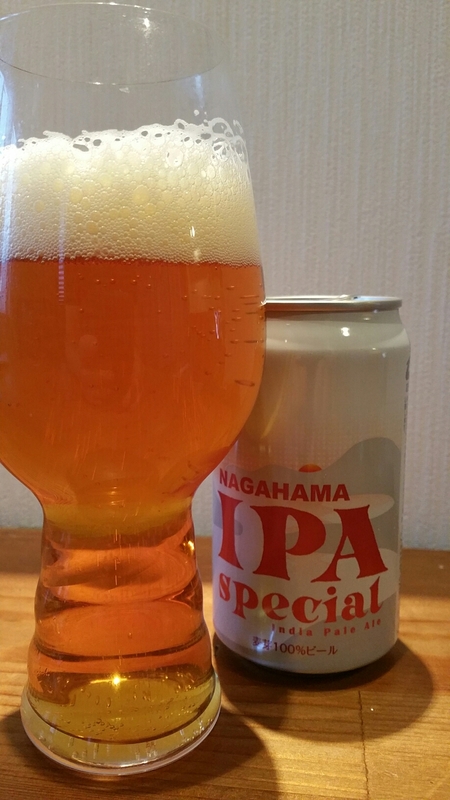 Nagahama IPA Special is a 5.5% American IPA from Nagahama Roman Beer based in Shiga prefecture. It’s brewed using Citra hops, with Nagahama Roman Beer stating that they use “ten times the amount of hops” they use in their pilsner. At the time of writing, Nagahama IPA Special can be found in both bottles and cans though we’re yet to see it on draft outside of the beerpub / restaurant. A pleasant, if run-of-the-mill IPA. It was a Saturday and I was looking for some Aooni IPA in Seijo Ishii in Ebisu. It’s not often I can’t find a decent craft beer but alas, all they had were either overpriced American beers (Sierra Nevada at ¥600 a can) or stupidly strong Belgian beers (A choco quad at 11% anyone). But then this can of Nagahama IPA Special was hiding at the back of the fridge and I hadn’t tried it before. Nagahama IPA Special poured out a light golden colour with a fair amount of frothy white head on top. With it being brewed with Citra hops, the aroma was fairly straightforward of citrus and pineapple; however, there was a slight, and I do mean slight, edge of caramel to it. It didn’t move on past that aroma but then that was expected. The body to Nagahama IPA Special was bitter, highly so, and along with the citrus and pineapple flavours, it seemed that the brewers at Nagahama Roman Beer had taken the American IPA route to its logical conclusion. Nagahama IPA Special was very easy drinking and well-balanced but never got going. A shame as it had a very solid malt base to work with. Nagahama IPA Special is a prime example of a single hop American IPA but it doesn’t get going besides the Citra tastes. Could have done with some other complementary hop to it. This IPA is good value for money (322 yen for a can, including tax), although there are better IPAs around. For me, it tasted bitter, but not so hoppy. I already commented on the three-letter-style with their WZN, but what about the design of the can? I like it, very simple, but my wife saw a couple of WZN and IPA cans in our fridge the other day and asked me “Are you drinking happoshu now?” I said of course not, rather water than happoshu, but the the simple design led her to believe that it was not real beer, but something else… I hope that other people do not confuse this good craft beer with happoshu!